Chancellor, Vice-Chancellor, honoured guests and graduands, it gives me great pleasure to be presenting today, Paul Stein (Chief Technology Officer of Rolls-Royce), for the award of Honorary Doctor of the University. Paul Stein graduated with a Bachelors Degree in Electrical and Electronic Engineering from King’s College London in 1978. He started his career at Philips Research Laboratories in Surrey developing technology and systems engineering techniques for early generation analogue cellular phone systems. In 1984 he moved to Mullard Equipment Limited, a specialist company that developed electronic equipment for the military, to apply his skills to defence products. He held a number of positions in technology and general management developing business in the commercial and defence communications markets. In 1993 he moved to Roke Manor Research, and was appointed Managing Director in 1996. Roke Manor is a high technology research and development business offering communications and sensors technology to the defence and commercial markets. It’s most famous commercially successful innovation is ‘Hawk-Eye’, the ball sports tracking system used for line call verification in tennis. He was invited to join the Siemens UK Executive Management Board in 2003 and in 2006 he then moved to the Ministry of Defence as the Director General for Science and Technology, responsible for the technical direction, prioritisation and out-sourcing of the UK’s investment in defence science and technology. It was in 2010, at the end of his three year contract with the MOD, that Paul joined Rolls-Royce here in Derby, as Chief Scientific Officer, and then as Director of Research and Technology in 2016. Rolls-Royce, of course, is a global manufacturer having some 50,000 employees worldwide. The company is famous for its aeronautical work, but does not only make jet engines, it also makes power systems including those for nuclear, rail, large earth moving vehicles and marine applications. It’s a company that prides itself on engineering excellence and making the best products in the world. The word ‘Rolls-Royce’ in the Oxford dictionary is associated with the highest quality products. In these roles, Paul supported the company to prioritise investment in view of business opportunities, understanding more deeply market and technology trends, and to examine areas where alternative and new technological approaches could lead to competitive advantage. Paul has also been instrumental in developing a culture of innovation in the company even while operating in an environment where, of necessity, safety must come first. During his time at Rolls-Royce here in Derby, Paul has personally supported the University in more deeply understanding the needs of the region’s manufacturing and engineering companies. He has supported the development of the University’s engagement with industry and the concept for the University’s Institute for Innovation in Sustainable Engineering. That support has yielded a portfolio of applied R&D projects and a cluster of PhD students who are working on projects for Rolls-Royce and their supply chain companies. Thanks to the foundations created by Paul at the University, our engagement is now moving from strength to strength with the opening of the new i-Hub building and the formation of the University of Derby Science Park, at Sinfin. Paul is a Fellow of the Royal Academy of Engineering, the Royal Aeronautical Society and the Institute of Engineering and Technology. As of April of this year, Paul was promoted to be Chief Technology Officer and part of the executive leadership team of Rolls-Royce. A role where he is responsible for all of Rolls-Royce’s technology investment, using the company’s edge in technology to drive commercial advantage in all the sectors in which the company operates. Paul is married with two children and two step-children, and lives in both Harrow and Ashbourne in Derbyshire. 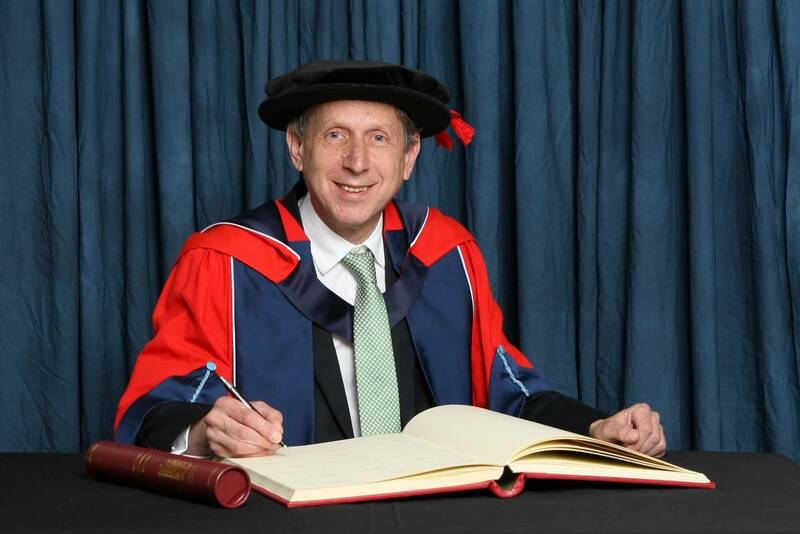 Chancellor, in recognition of his work at the very highest levels of engineering and technology and his contribution to our University, our City and our region, we are delighted to award Paul Stein the honorary degree of Doctor of the University.